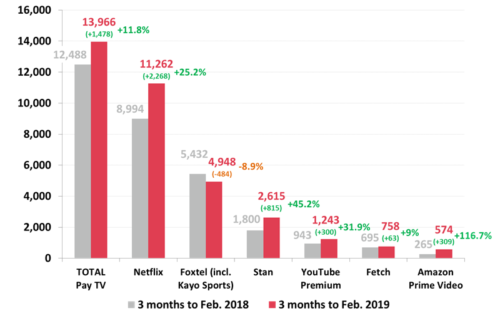 Nearly 14 million Australians now have access to some form of Pay TV/Subscription TV, up 11.8% on a year ago, and it’s not just Netflix driving the increase with large year-over-year increases for several SVOD services including Netflix, Stan, YouTube Premium and Amazon Prime Video. The leading Australian-owned SVOD is Stan which is now accessible by over 2.6 million Australians up an impressive 45.2% on a year ago. Stan is a fully owned subsidiary of the Nine Entertainment Company. However the largest increase was for Amazon Prime Video which more than doubled its user base over the last year by 116.7% to over 570,000. Michele Levine, CEO Roy Morgan, says: “Pay TV/Subscription TV services are an increasingly competitive marketplace in Australia. Going forward the battleground will be content and cost. To charge for a service there needs to be unique valued content e.g. live sport. Just this week we have learned that Australia’s leading football code the AFL has been approached by well-known global streaming giants about acquiring the rights for the AFL when the next rights deal begins in 2023.